Over the moon about Molly – but is the trip worth it? 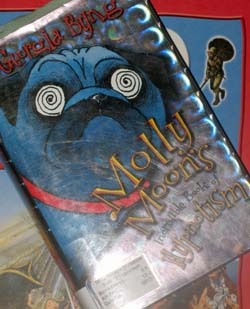 I’m certain it was the bright-blue goggle-eyed pug on the cover that drew Big Guy’s attention. The fact that I was trying to steer him to what I thought was more age-appropriate reading material – I heard “Diary of a Wimpy Kid” is funny, I told him – kept him locked in. “He- … he-wipe-no … What is this word?” Big Guy asked. Oh, we’re off to a great start, I thought. “Hypnotism,” I said. “Are you sure you don’t want to try something easier?” Drat. Why did I have to say “easier”? Big Guy doesn’t like things easy. He’s going to take it as a challenge. “No. I want this one,” came his predictable response. I snuck a copy of “Wimpy Kid” into my stack. We’ll need it, I thought. “You can go anywhere you want in your imagination,” I said. Molly can go a little farther than most. She lives in a drab English orphanage and has only one friend, whom she quickly manages to alienate. But when she discovers a book about hypnotism, she also discovers that she has a talent. Molly has become our nightcap. We read a chapter just before bedtime, Big Guy and I taking turns by page. It’s slow going. Though he can read about 85 percent of the words, the sentence structure is far more complicated than in the Junie B. Jones he’s reading at school. Some of the concepts are a stretch, too – but, then, I knew that when I started off having to explain hypnotism. But when he went to school and bragged to his teacher that he was tackling a “fifth-grader book” – that’s the reading level the library marked on the spine – she told him it was a bad idea. “You won’t be able to understand it,” she said. I’ve second-guessed the decision nightly since then. Can he really understand it, I wonder, even though he seems to. Is it making reading so torturous that he won’t love doing it anymore? Big Guy was at Level 10 Developmental Reading Assessment, the diagnostics our district uses, in December. However, according to Scholastic, Junie B is a 20 to 24, and he’s handling that. Molly, though, is a 44. Yikes! According to yet another chart on Scholastic, a 10 DRA translates to a Lexile 300 to 600. I throw that figure in because when you look at Molly’s Lexile score of 770 it might not be that far over his head after all, because Lexile says children’s comfortable reading levels are from 50 below to 100 above their measurements. I freely admit that I’m doing a lot of rationalizing and extrapolating on what his Lexile might be. There are enough apples and oranges there to feed the guys fruit salad for a week. Oh, and the “easier” Wimpy Kid I suggested he read – Lexile of 950, which means it might be harder to read than Molly. Except when you compare grade-level equivalents on Scholastic, those numbers indicate that Wimpy is easier . Yes, I’m overlooking the irony of depending on testing and Lexile, the same company that has hopelessly DIBEL-ed up kindergarten with its emphasis on flash cards and sight words at the expense of the joy of reading. And now I’m simply throwing up my hands on the “to read or not to read” question. I’ve offered Big Guy several chances to quit reading Molly, and he always declines. Part of it’s simply his competitive nature – we’re going to finish that 371-page book no matter how long it takes. But he also loves the story, particularly last night’s chapter where Molly “threw up” ketchup and water in order to trick the headmistress into believing she was sick. Note to self: Hide the ketchup bottle. The biggest reason I stick with it, though, is because Big Guy believes he can read it. For every day that he goes on believing that, he’s one day closer to truly being able to read it all on his own. This is a great post and really describes that common bind between book levels and the interests of young readers. Full disclosure here — I work for Lexile. Keep in mind a Lexile measure is a measure of independent reading ability. Once you recognized that the syntax of this book challenges this reader’s current ability — whether by eyeballing the text or by checking Lexile measures — you changed the reading experience to be partly independent, not fully independent. It’s a great move, one that I do with my 5th-grade daughter. We take turns reading chapters, or one of us reads the right pages and the other reads the left ones. In any case, giving a reader the support he or she needs to read a book he or she wants to read, regardless of its level or measure. It’s pretty crucial (obviously) to help these experiences to happen. Any system or program that takes a book out of a young person’s hand should probably be against the law, you know?